What is Chicken Soup for the Cat Lover's Soul Canned Cat Food? Chicken Soup for the Cat Lover's Soul Canned Cat Food is a canned food for your adult cat. 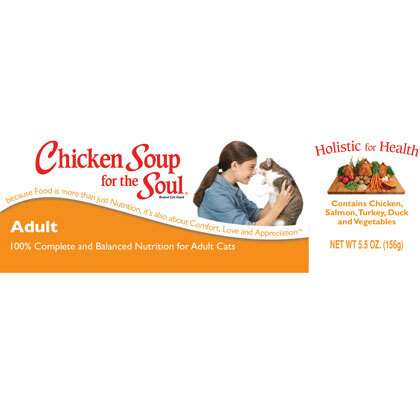 Made with fruits and vegetables, Chicken Soup for the Cat Lover's Soul Canned Cat Food provides adult cats with the well-balanced nutrition they crave in a soft scrumptious food. Chicken Soup for the Cat Lover's Soul Canned Cat Food includes four meat proteins - chicken, salmon, turkey, and duck - and all of them work to provide your cat with satiating proteins instead of fillers or additives. Chicken Soup for the Cat Lover's Soul Canned Cat Food can be given to your cat on a daily basis for a well-balanced meal. It contains fresh, whole some ingredients like carrots, peas, and apples, and four different types of meat - chicken, salmon, turkey and duck. Just open a can and watch your furry feline devour every last morsel. Only feed your cat the appropriate dosage on the Chicken Soup for the Cat Lover's Soul Canned Cat Food label, or as directed by your vet. Ingredients: Chicken, chicken liver, salmon, turkey, duck, chicken broth, whole grain brown rice, white rice, oatmeal, potatoes, barley, egg product, guar gum, flaxseed meal, kelp, carrots, peas, apples, dried skim milk, cranberry powder, rosemary extract, parsley flake, taurine, dried chicory root, carrageenan gum, vitamin A acetate, vitamin D3 supplement, vitamin E supplement, niacin supplement, D-calcium pantothenate, riboflavin supplement, thiamine mononitrate, pyridoxine hydrochloride, vitamin B12 supplement, biotin, folic acid, copper sulfate, calcium iodate and sodium selenite. Calorie Content:1,200 kcal/kg (187 kcal/can) Calculated Metabolizable Energy. AAFCO Statement:Animal feeding tests using Association of American Feed Control Officials procedures substantiate that Chicken Soup for the Cat Lover's Soul Adult Cat Formula provides complete and balanced nutrition for maintenance.